Region: This wasp comes in a variety of species that can be found throughout North America. Life cycle: The queens, after mating, hibernate in bark forming new colonies each spring. These new populations disperse in the fall. 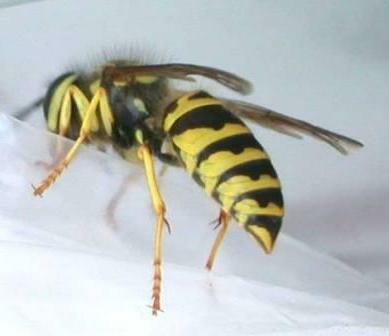 Physical Description: This yellow and black wasp has clear wings that are folded along side of the body when not in use. They grow to about 1/2 to 3/4 inches long. The eggs are laid in papery cell colonies mode of glued together plant materials forming hollow logs/stumps. Feeding characteristics: Adult wasps feed on pollen, nectar, and small insects. They capture the insects to feed their young.